Javaslang was created by software developer Daniel Dietrich and first released in 2013 to coincide with the early release of Java 8. It leverages Java 8’s lambdas to “create various new features based on functional patterns” with the intent to replace Java’s standard collections with a functional collection library. New interfaces, Future and Promise, for concurrent programming. While the version 3 changeset is being planned, the development community is encouraged to participate in Javaslang’s Gitter discussion, peruse the formal list of proposals, and contribute. InfoQ: What sets Javaslang apart from other functional libraries, like jOOλ, StreamEx, and Cyclops? Some of the basic ideas behind Scala are also valid for Javaslang, for example the similar persistent collection hierarchy. The learning curve is smooth. Using Javaslang should be easy for those of us who are already familiar with Scala. There is much Scala documentation available that is also valid for Javaslang, especially on how to solve common problems with the collection library (e.g. on Stack Overflow). Javaslang is more expressive/concise than plain Java 8 and might also be faster than Java 8’s Stream (see benchmarks of our upcoming Vector: https://github.com/javaslang/javaslang/pull/1557). jOOλ and StreamEx contain utility functions, they work well for making it easier to use Java 8’s Stream. But users still have to write unnecessary, noisy code. More lines of code correlates to more errors. Cyclops is a niche library for distributed programming but not as popular as RxJava and Akka. It looks a little bit like a playground for functional-ish features, like stackless recursion with trampolines and lifting of monadic types. These are not practical in Java, and intentionally these features were not included in the Javaslang core. InfoQ: Does the delay of Java 9, now scheduled for July 2017, affect your planned release of Javaslang 3.0 in March? Dietrich: Javaslang will stay backward compatible to Java 8. 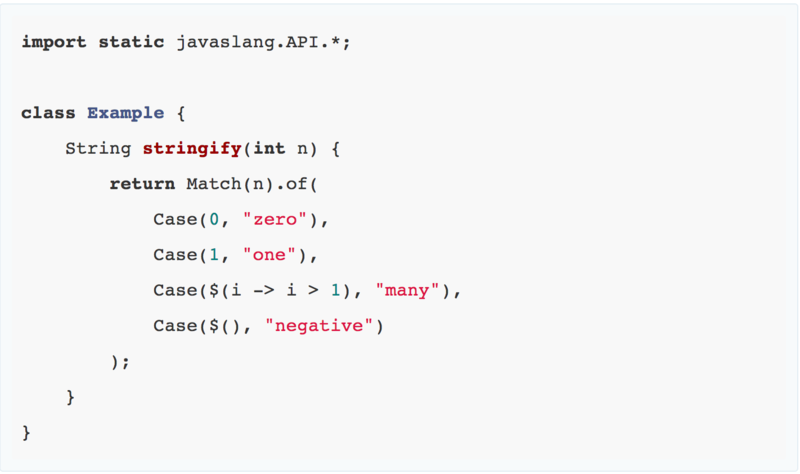 New Java features that will influence the Javaslang API will be shipped with Java 10. So I currently see no reason why the delay of Java 9 should affect the release date of Javaslang 3.0. However, there are already changes to the roadmap. 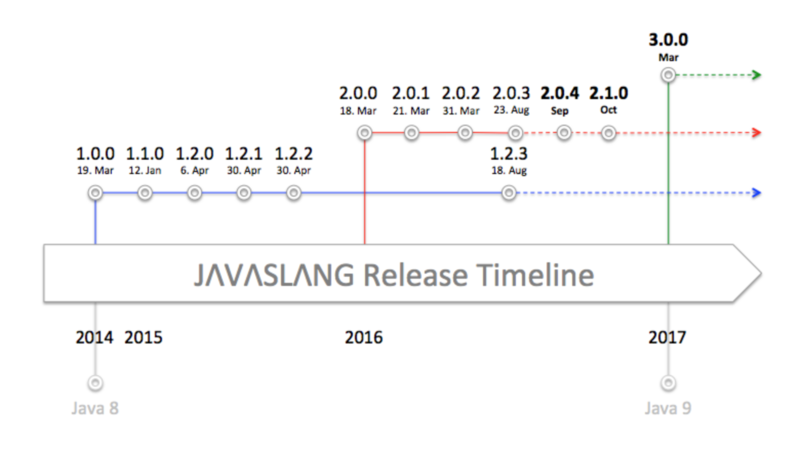 InfoQ: Are there any updates you can share on the release of Javaslang 2.1.0 and/or the roadmap to Javaslang 3.0? Dietrich: The development and testing of the new Javaslang features will take more time. We will make a public BETA version of Javaslang 2.1.0 available at the end of this year. The work on Javaslang 3.0 will be started after the release of Javaslang 2.1.0 to reduce friction losses. To compensate the delay of 3.0, we will include some features into 2.1.0 that were originally targeted for a posterior release. A complete list of features can be viewed on our project site https://github.com/javaslang/javaslang. Javaslang 2.0.x is already pretty mature, so we will take our time to get 2.1.0 right. I currently cannot tell an exact release date but I want encourage our users to start testing the BETA version and release candidates as soon as they are available. Javaslang 3.0 will not be backward compatible to Javaslang 2.x. From the user-perspective the upcoming 2.1.0 release is more interesting regarding existing code bases that already depend on Javaslang. The 3.0 release will be the future of Javalsang. Go Beyond in the Functional Paradigm with Javaslang by Ismaël. Javaslang - Functional Java Done Right by Grzegorz Piwowarek. 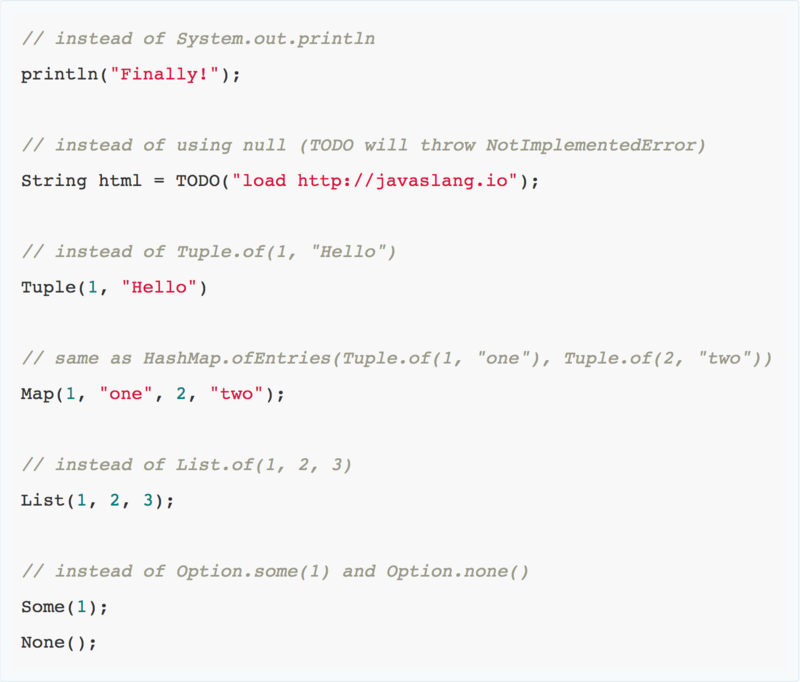 Functional Programming in Java: Getting Started with Javaslang by Federico Tomassetti.